FLINT, MI — Flint Beat in partnership with NBC25/FOX66 will host a mayoral forum at the Flint Public Library located at 1026 E. Kearsley Street on October 19 and 24, 2017 from 5 to 7:30 p.m. 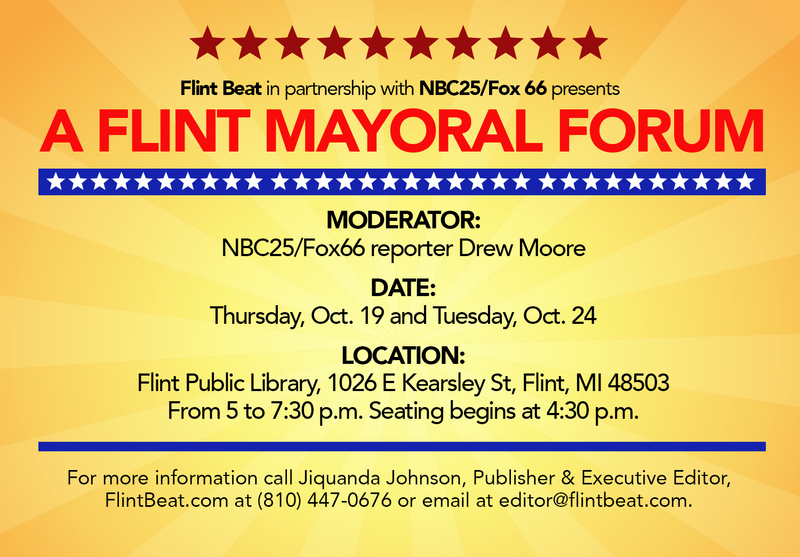 The forum, “Flint Mayoral Forum” is hosted by the two news outlets with NBC25/FOX66 reporter Drew Moore serving as moderator for the event. Candidates Chris Del Morone, Woody Etherly, Anderson L. Fernanders, Ray Hall, Brent Allan Jaworski, Ellery Johnson and David W. Meier, are set to participate in the Oct. 19 forum. Seating for the event will begin at 4:30 p.m. with the forum commencing promptly at 5 p.m.
For more information contact Jiquanda Johnson of Flint Beat at (810) 447-0676 or email her at editor@flintbeat.com.